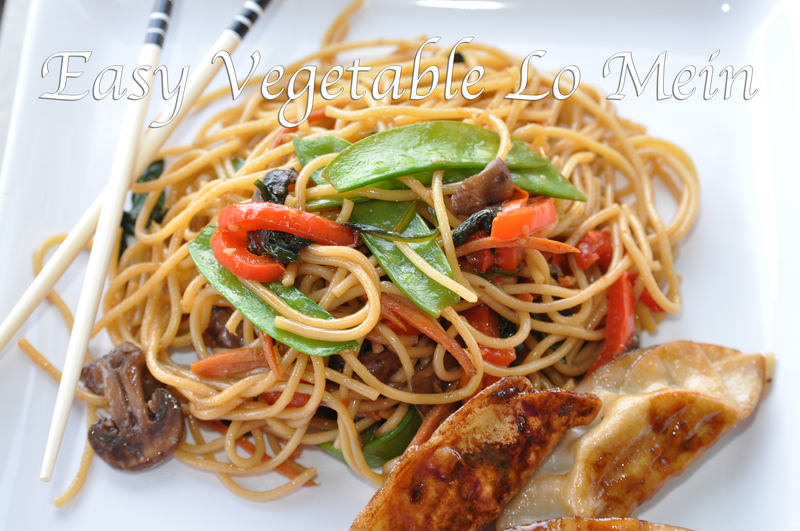 Vegetable Lo Mein – Mama, Can I Lick the Spoon? My family has a serious addiction to Asian cuisine. We really love the stuff! One of our favorite restaurants in town is a Chinese buffet. We like going there for two reasons: #1. Everybody can get what they like, and #2. Our growing teenage boy can eat as much as he likes without one of us selling a kidney to pay for it! I love to cook, so a while back, I watched enough YouTube videos to learn to make sushi. We love it. Our sushi making is a family event. We chop and press and roll and slice together. Somehow I’m always the only one who gets sticky hands through this process, but we have a great time making sushi and an even better time eating it! Michael and Christopher brought home frozen Chinese food one evening last week. Egg rolls, fried rice, orange chicken, General Tsao’s chicken, low mein. It was awesome. And I was tired, so just being able to heat stuff up was great. It was all really good, but the lo mein was fabulous. 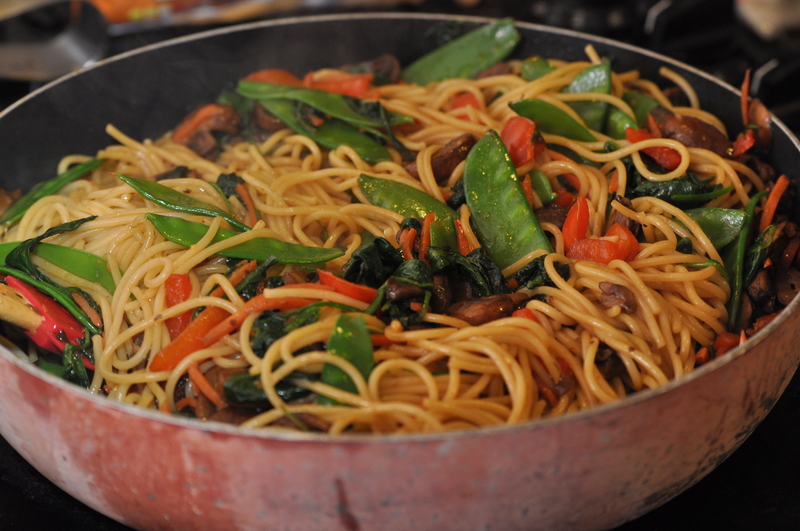 And I knew that fresh, homemade lo mein would be even better. So I decided to learn to make it. 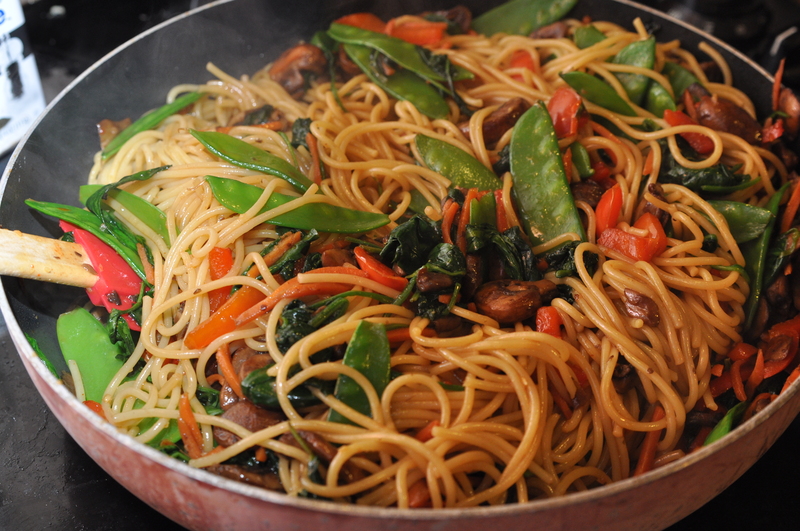 The thing with lo mein is that you can make it your own by adding whatever vegetables your family likes. 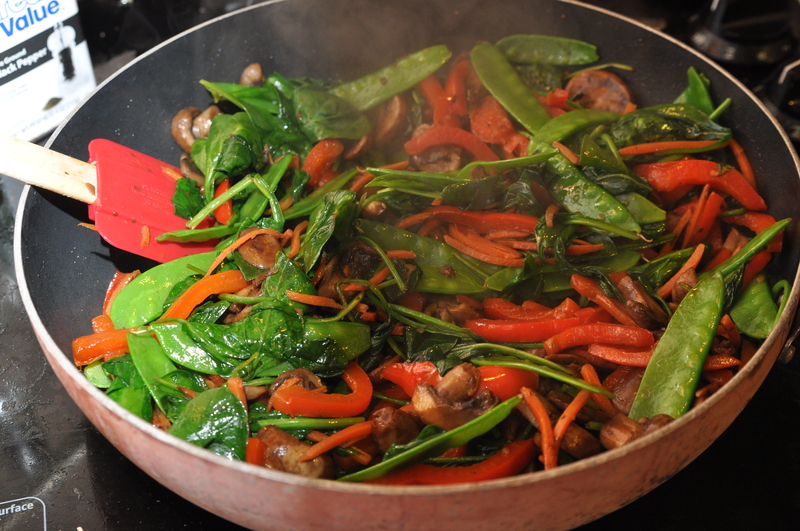 My tribe is not picky, so I chose snow peas, red bell peppers, spinach, and cremini mushrooms. Cheap, quick, easy, and delicious! I will be making this a LOT! Start by cooking your pasta and draining it. I just left mine in the strainer while I cooked the vegetables. In a small bowl, you’ll whisk together the sauce ingredients – soy sauce, sugar, sesame oil, ginger, and Sriracha. Just set that aside. 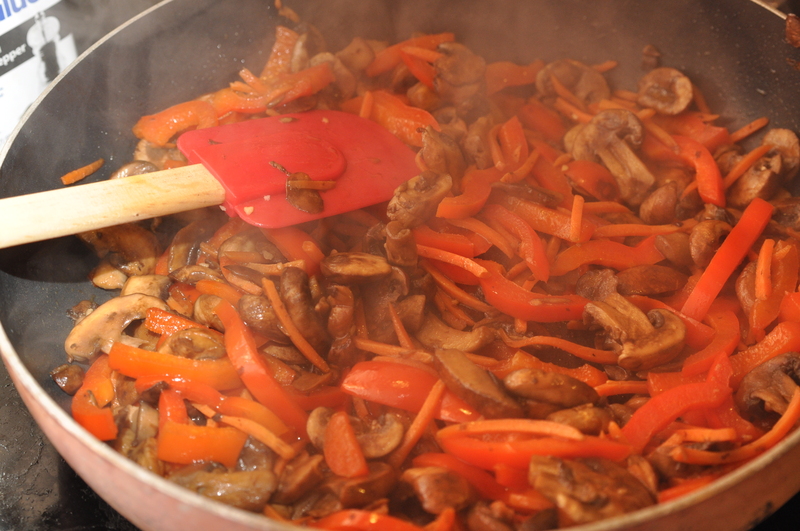 In a large skillet, heat olive oil and add the mushrooms, garlic, carrots, and bell peppers. Cook and stir until tender. Stir in the snow peas and the spinach – SIX cups of spinach! Within minutes of stirring, the spinach will wilt down. After it’s wilted, add the pasta and toss to combine. Then add the sauce and toss again. For real, it is delicious! Just a little kick from the Sriracha and so savory from the soy sauce, the sesame oil, and the ginger. The vegetables are fresh and delicious. We loved it! Cook pasta according to package directions. Drain and leave in strainer. Whisk sauce ingredients together in a small bowl. Set aside. Heat olive oil in a large skillet. Add garlic, mushrooms, bell pepper, and carrots. Cook and stir for 4-5 minutes until vegetables are tender. Add the snow peas and spinach. 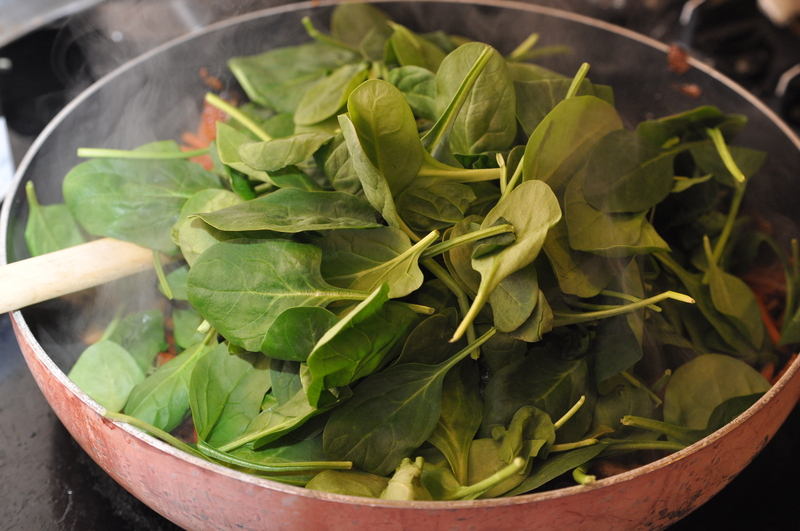 Continue to stir spinach until it is wilted. Add the noodles and toss. Add the sauce and toss until heated through. Well Duh #1: You can add more Sriracha, if you like. You can leave the Sriracha out, if you like. It’s up to you! Well Duh #2: You can use white mushrooms instead of creminis. I just found creminis on sale. They really do taste delicious. They are, after all, baby portabellas! Well Duh #3: I buy my ground ginger in a tube. If your grocery store has it, it will be in the produce section. It’s way easier than buying that big, chunky, alien-looking root and then having to peel it and grate it yourself. Squeezing a tube is much less daunting. Well Duh #4: You can certainly add more soy sauce, if you think you need it. Well Duh #5: I couldn’t find lo mein noodles, so I went with regular spaghetti. Nobody noticed or complained. They were too busy slurping it up! Well Duh #6: I served this with egg rolls and pork pot stickers – both from the frozen section. They were delicious! Well Duh #7: You could certainly add chicken and shrimp. I would sautee the chicken before I started adding the vegetables to the pan. With the shrimp, I would probably add those just after the spinach started to wilt and cook until they pink up. This made a ton! Enough for everyone to fill up and still have leftovers the next day! This is definitely a recipe I will be revisiting often! The kids have already asked when we can have it again! Christopher wants me to make more so he can have it in his lunch! I’m sure some of our Asian friends will see this recipe and giggle at its lack of authenticity.